Archery Hire. 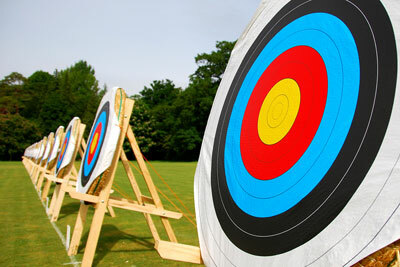 Mobile Archery Hire and Archery Taster Sessions from Lichfield Inflatables. Using specially converted arrows with foam tips try and shoot down the balls that hover in an airstreams coming from the inflatable. 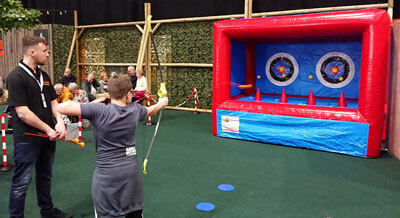 This game can be used both indoors and outdoors and with a range a bow sizes plus crossbows for the really small children it can be played by all ages. In Archery Tag two teams compete against each trying to the be first to knock down all of the opposing teams targets or 'tagging' all of their team members with arrows. The arrows are all foam tipped for safety, faceguards are provided, and each team has three large inflatable bunkers to take cover behind. This game is suitable for ages 10 to adult. If you have any queries, questions, or would like to book a mobile Archery session please call us on the number below or click to enquire and we will do all we can to help. If you're holding a medieval themed event why not take a look at the Medieval themed Wrecking Ball we also have for hire?